Battaglia Homes proudly features one of its beautifully crafted cottage style homes in the Summer 2012 issue of LUXE magazine. 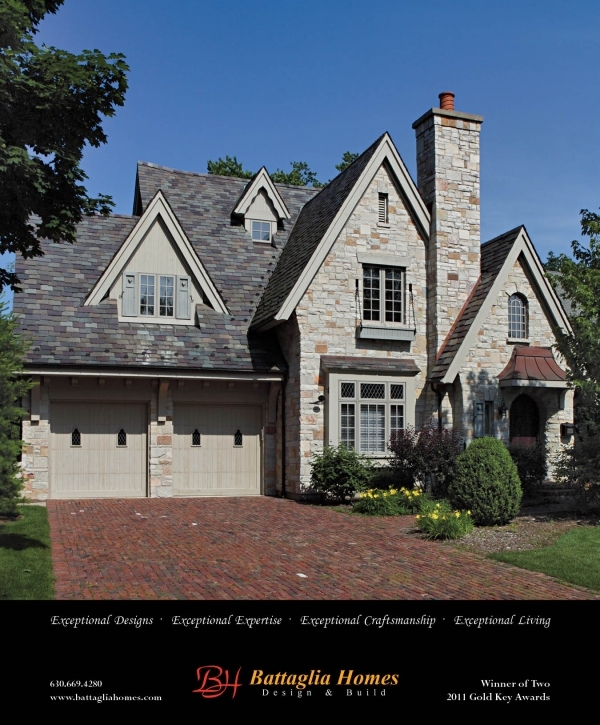 Located in Hinsdale, IL the home’s exterior stays true to the classic finishes found in old English Cottages. Features include steep roof lines, slate roof, steep gables, large prominent chimneys, stone & stucco exterior, round top door, leaded glass windows and a quaint porch with large timbers. The home’s interior boasts beautifully finished walnut hardwood floors, a custom walnut staircase, finely crafted custom cabinets, coffered ceilings, wainscoting and three piece crown molding. Call Battaglia Homes today at 630-669-4280 to discuss your ideas about building your dream home.